Albion’s downtown bricks came in different sizes through the years. I thought our readers might like to have an overview of the history of our downtown brick street, and how to tell the bricks apart from one another. The first pavement in town was laid in 1903 from Ash St. on the south, to the Lake Shore & Michigan Southern Railroad tracks on the north at a cost of $25,500. This is the same stretch-length that we have today in 2017. That first pavement however did not consist of nice red bricks that we are all familiar with today. Superior Street was first paved with asphalt block bricks which required a lot of maintenance. I don’t know of any of these which have survived. The inferior asphalt blocks were subsequently removed around 1910 (I don’t have the exact year) and replaced with real bricks manufactured by the Metropolitan Paving Brick Company of Canton, Ohio. A large deposit of Clarion shale by their plant there made an excellent ingredient for these high-grade bricks. These bricks measure a huge 8 11/16" long x 4" wide, and 3 5/8" thick. 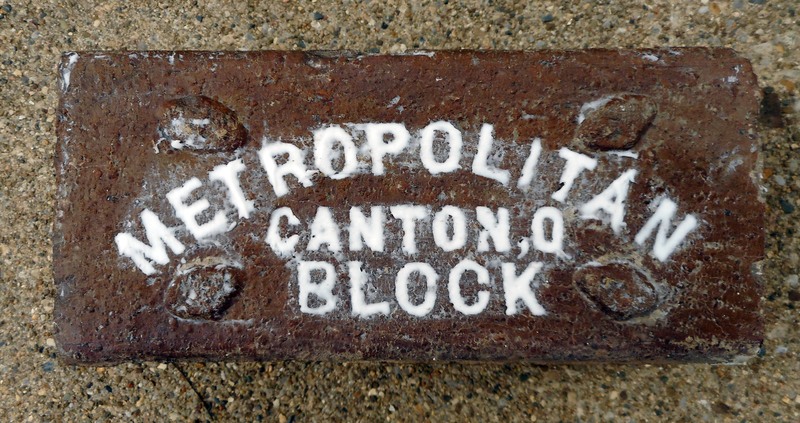 The bricks laid in Albion are lettered on the bottom: "METROPOLITAN BLOCK," CANTON, O." There are four raised diamond-shaped "lugs" on this side, one on each corner for traction. They lasted until 1940 when they were replaced. According to my too-accurate bathroom scales, each brick weighs 10.2 pounds. Bricks were also laid during the 1910s up Superior St. hill, and Austin Avenue, as well as on Erie St.
A few of the bricks managed to slip by in 1940 and were buried under the new concrete base. Some were unearthed this year during the current brick paving project. These 1910 bricks were later recycled to line the sides of the roads in Victory Park for drainage, and are still there today. From our Historical Notebook this week we present two photographs. 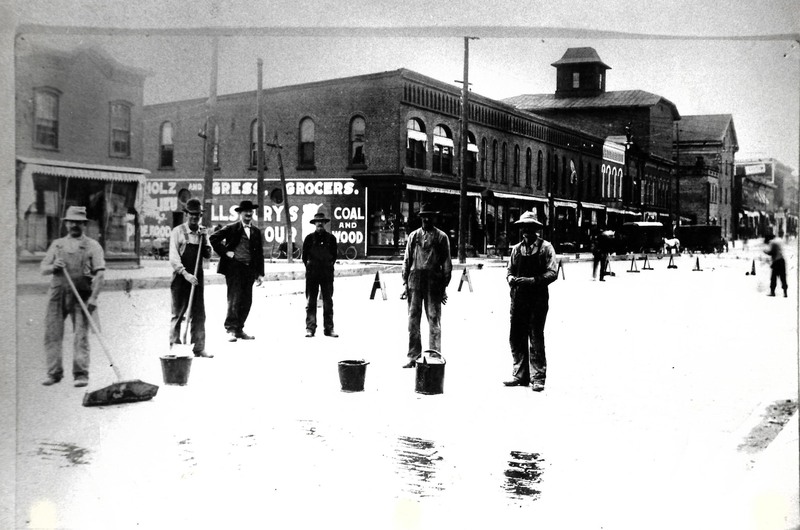 The first dates circa 1907 and shows workers applying messy maintenance tar and sand on the original asphalt blocks in front of the Parker-Kessler Block, currently our new Ludington Center. Our second photograph is a close-up of a Metropolitan paving brick, used until 1940. Oh, I put shaving cream on the brick to fill in the letters for better photographing.